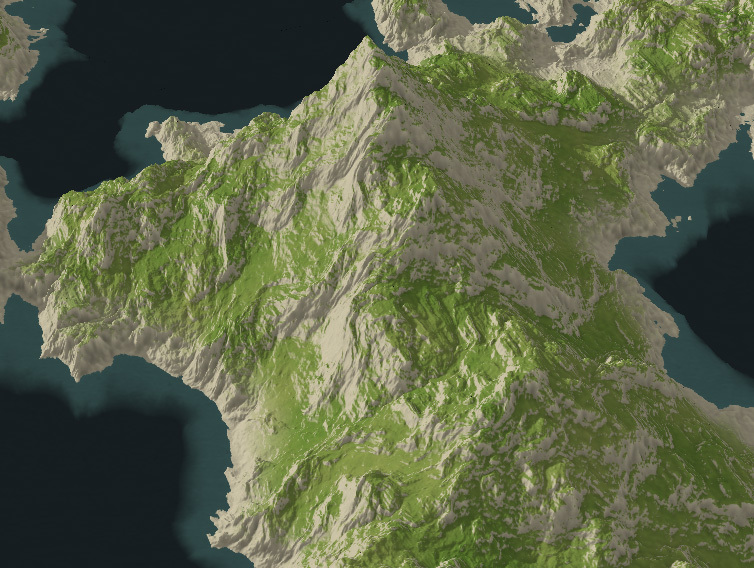 World Machine ist ein sog. 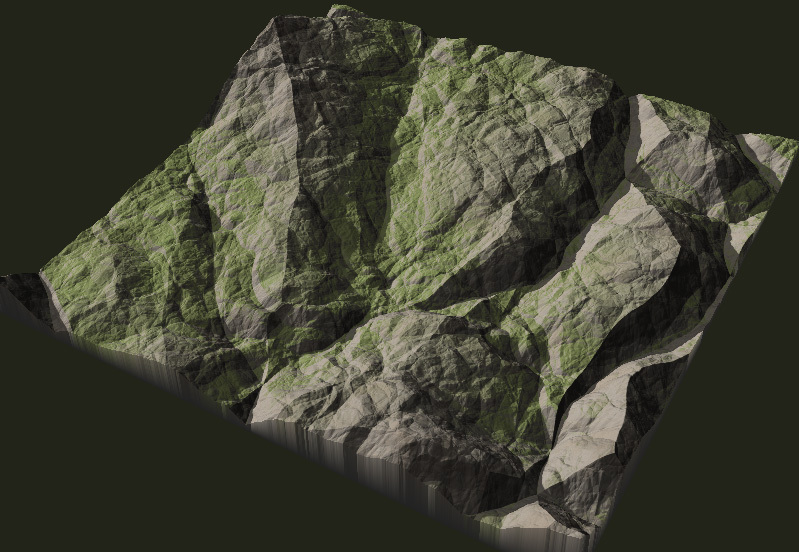 „Terrain-Editor”. Der gene­riert vor allem das Ter­rain, also die Grund­form der Land­schaft, für Ter­ra­gen. Eine kos­ten­lose Ver­sion von World Machine kann auf der WM-Website her­un­ter­ge­la­den wer­den. Dort fin­den sich auch noch wei­tere Infor­ma­tio­nen zum Pro­gramm. (Eine kos­ten­lose Ver­sion von Ter­ra­gen 2 gibt es auf der Seite von Pla­nets­ide.) WM ist ein rela­tiv kom­ple­xes Pro­gramm, man muss im wesent­li­chen Fil­ter zusam­men­ste­cken, ähn­lich wie in einem Schalt­kreis. Wenn man will, kann man auch eine Reihe von Fil­tern in ein „Macro” packen. Braucht man den Effekt spä­ter wie­der, nimmt man das fer­tige Makro, statt den gan­zen Kram wie­der von vorn auf­zu­bauen. Auf die­ser Seite kannst du ein paar mei­ner eige­nen Makros run­ter­la­den. 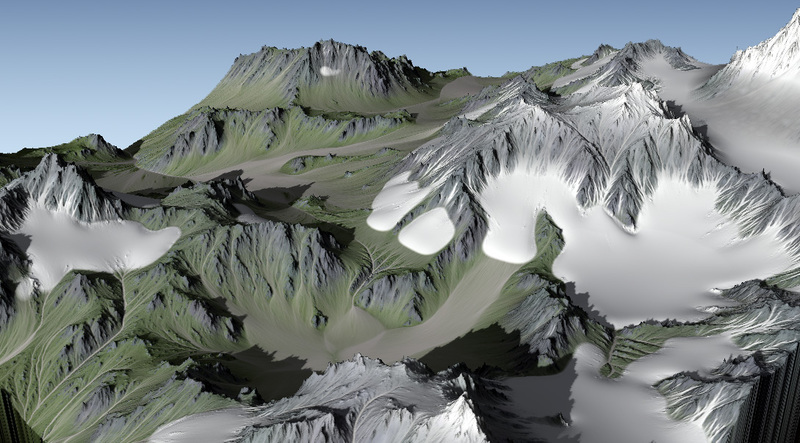 World Machine is a Terrain-Tool, ori­gi­nally desi­gned to gene­rate the ter­rain, the basic shape of the land­scape, for Ter­ra­gen. A free edi­tion is avail­able on the WM web­site where you can find more infor­ma­tion about the pro­gram. WM is a quite com­plex pro­gram. You basi­cally have to con­nect a bunch of fil­ters, much like in an elec­tri­cal cir­cuit. To make your life easier, you can put mul­ti­ple fil­ters into a sin­gle one - a „macro”. So if you need the same effect later, you don’t have to start plug­ging the whole thing toge­ther again - you just load the macro. You can down­load some of my own macros below. ist ein Gene­ra­tor ähn­lich wie Per­lin Noise, er besitzt auch die glei­chen Para­me­ter. Zusätz­lich kann man einen von acht ver­schie­de­nen Styles aus­wäh­len. Diese haben Code-Namen nach diver­sen Gesteins­ar­ten und sind eher zufäl­lig gewählt. Je nach Style und Shape erge­ben sich ganz unter­schied­li­che inter­es­sante For­men - es lohnt sich, die mal herumzuprobieren. Vor­o­No­ise is a frac­tal noise gene­ra­tor simi­lar to Per­lin Noise and with the same par­amters. In addi­tion you can chose from eight dif­fe­rent Styles and two Shape types, each pro­du­cing a dif­fe­rent kind of ter­rain - usually pretty inte­res­ting ones! erzeugt von oben nach unten ver­lau­fende Kan­ten. Im All­ge­mei­nen wer­den die nur plump auf das Ter­rain gezeich­net, man kann aber am zwei­ten Out­put Port auch nur die Ridges abneh­men und dann wei­ter verarbeiten. 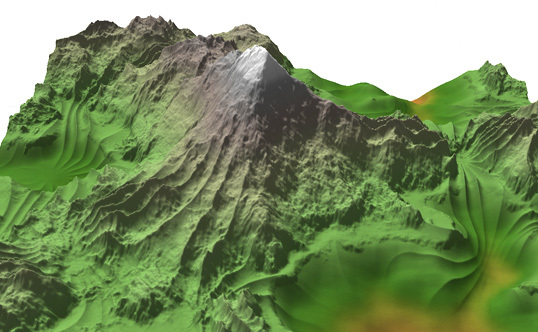 This macro crea­tes ridges run­ning from the peaks to the val­leys of the ter­rain. If you don’t like the way the macro com­bi­nes those with the ter­rain you can just take the second out­put which con­tains the ter­ra­ces only. Die­ses Makro gene­riert ein Bit­map für den in WM2 neuen Over­lay View. Gedacht ist es, wie der Name schon sagt, für Küs­ten­re­gio­nen. Man kann den Mee­res­spie­gel und die Nei­gung, aber der Gras wächst ein­stel­len. Außer­dem kann die Rich­tung der Son­nen­ein­strah­lung fest­ge­legt wer­den - in den ent­ste­hen­den Schat­ten wird eine Art Ambient-Occlusion angewandt. This macro gene­ra­tes a bit­map for the new Over­lay View in WM2. It is desi­gned for coas­tal regi­ons. You can adjust the sea level, the slope at which gras begins to grow and the hea­ding of the sun - some kind of ambi­ent occlu­sion is applied to the shadows. Smooth Lay­out ist ein Weich­zeich­ner für Lay­out Shapes. Es ent­fernt beson­ders die lan­gen Kan­ten, die an den Bie­gun­gen des Lay­outs entstehen. Smooth Lay­out blurs Lay­out Shapes, thus remo­ving those long edges that tend to occur at the bends of the Layout. schärft ein Ter­rain nach, ähn­lich wie große Gra­fik­pro­gramme es auch tun. Shar­pen - get ready to be sur­pri­sed! - shar­pens a ter­rain much like big gra­phics pro­grams do it. Die­ses Makro ist ein ein­fa­cher Hoch-Passfilter, d.h. nied­rige Fre­quen­zen wer­den her­aus­ge­fil­tert, die hohen blei­ben. Die gefil­ter­ten nied­ri­gen Fre­quen­zen ste­hen am zwei­ten Outpu-Port zur Verfügung. High Pass is a sim­ple high-pass fil­ter - it sup­p­res­ses low fre­quen­cies, keeping only the high ones. You can get the fil­te­red low fre­quen­cies from the second out­put port. Die Umge­keh­rung des Fre­quency Split­ter. Wird er direkt nach dem Split­ter ein­ge­setzt, kommt wie­der das Ursprungs­t­er­rain heraus. The inver­sion of the Fre­quency Split­ter. Using it directly after the Split­ter pro­du­ces the ori­gi­nal terrain. 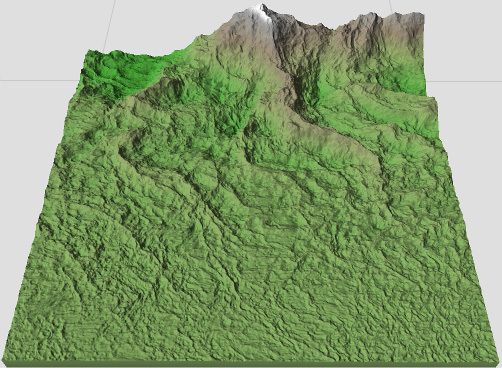 erzeugt Glet­scher anhand der Flow-Map des Erosion-Devices. Gegen­über der vori­gen Ver­sion wur­den viele Devices gelöscht, beson­ders die inzwi­schen über­flüs­si­gen Split­ter und Devices die kei­nen loh­nens­wer­ten Ein­fluss auf das End­er­geb­nis hat­ten. Außer­dem muss man das Makro nun selbst mit Ero­sion füt­tern. Alles in allem ist Ver­sion 1.3 wesent­lich schlan­ker, schnel­ler und spei­cher­scho­nen­der als v1.2. Ob das Resul­tat wirk­lich nach einem rea­lis­ti­schen Glet­scher aus­sieht, dar­über kann man natür­lich strei­ten. Ande­rer­seits kenne ich auch kein Makro, das es bes­ser macht. This macro crea­tes gla­ciers based on the flow map of the ero­sion device. Gla­ciers v1.3 has chan­ged a lot since the pre­vious ver­sion, ero­sion now has to be done outs­ide the macro, many devices that weren’t nee­ded any­more or didn’t have enough impact on the final result have been remo­ved resul­ting in a much fas­ter macro taking up less ram too. Whe­ther the gla­ciers it crea­tes are rea­listic can cer­tainly be dis­pu­ted. On the other hand, there’s not other macro I know of that does a bet­ter job. Dunefield erzeugt eine mit Dünen gefüllte Fläche. Dunefield crea­tes a dune fil­led terrain. Hybrid Blur ist eine schnelle Alter­na­tive zu Gaus­sian Blur. Es besteht aus zwei Uni­form Blur Devices, was den Gauss-Filter bes­ser annä­hert als ein ein­zel­nes Uni­form Blur. Des­sen typi­sche Arte­fakte wie etwa senk­rechte Linien wer­den so ver­mie­den. Den­noch ist das Makro 35% schnel­ler als ech­tes Gaus­sian Blur. Hybrid Blur is a fas­ter alter­na­tive to gaus­sian blur. It con­sists of two uni­form blur devices, which takes the macro one step clo­ser to gaus­sian blur. In par­ti­cu­lar you don’t get the typi­cal arti­facts that come with uni­form blur such as strai­ght lines. The macro is still about 35% fas­ter than real gaus­sian blur. ver­schiebt das Ter­rain der­art, dass Teile, die auf der einen Seite raus­fal­len, auf der ande­ren wie­der auftauchen. shifts the ter­rain along a given direc­tion such that parts that are pus­hed outs­ide on one side reap­pear on the other side. Coole Makros. Da werde ich bestimmt mit herumexperimentieren. Ja, super Sachen - Danke !!! Many Thanks for these Macros. Gibt es eigent­lich das River Bed Macro noch? Nö. Das River Bed macro macht per­for­mance­mä­ßig nur Sinn, wenn man kein Cur­ves Device hat. Das ist aber inzwi­schen in allen Ver­sio­nen von WM drin. Thanks a lot for all these macros. Is there any function/device in wm to change the over­all fea­ture scale of this macro, like the fea­ture scale I can find in the advan­ced perlin. Hi Qwak, glad you like my macros! I guess set­ting the ren­der extents in Lay­out View is not an option? It can only „zoom out” though. Thank you so much to edit you macro just for me, I didnt expect that ! Nico, thank you so much for pro­vi­ding your dev files to us. 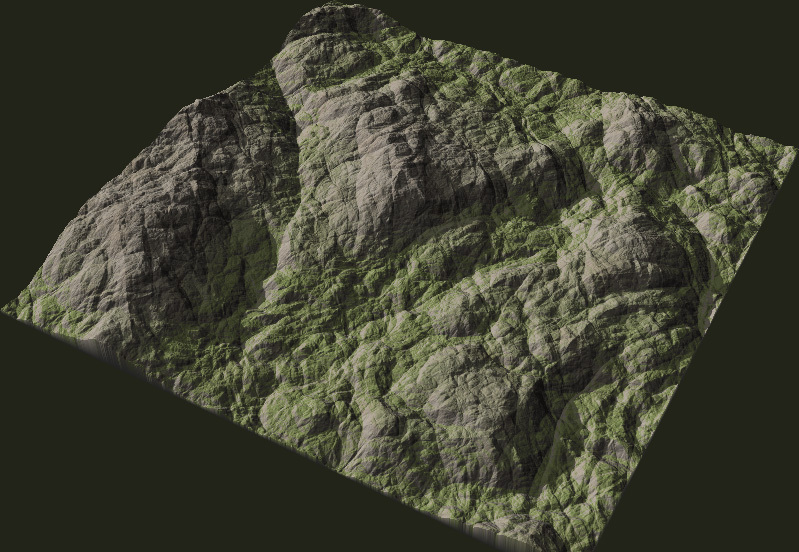 I am very new to World Machine. I have down­loa­ded your dunefield dev file and I’ve loa­ded it as a macro device and con­nec­ted it to the default out­put. 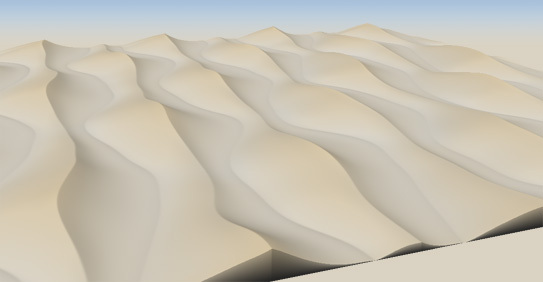 Could you please help me under­stand why the peaks of the dune fields are so high and how I can change this? It’s been a while since I last used WM, but iirc you can just use the clamp device.